Editing in on October 08 2018 — Shari Dovale has posted this article at Redoubt News, HERE. The Redoubt News YouTube channel has also posted all of the “Forensic” video series by Curt Kruse, HERE. The Mental Millitia is deeply grateful to Curt Kruse for first offering the following video for publication. 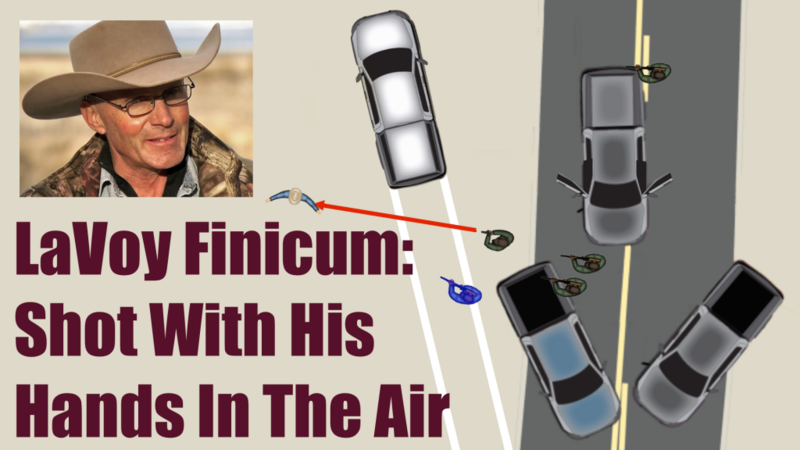 This makes the fifth deep analysis video of various factors in the wrongful death of LaVoy Finicum, who was murdered by the Oregon State Police with assistance by the FBI in Oregon in January 2016. Here are the eight videos by Curt Kruse as of January 2019. The following is a somewhat lengthy “comment” I posted under one of the “Forensic” videos by Curt Kruse on my YouTube channel. I wish to re-post it here under this article just so I won’t lose it. Why do I want to keep it? Because it is going to be part of a series of articles I would like to write about the Ranch Revolution next year. That aside, there is value in the conceptualization of a vague, but never-the-less stunning, “over-view” which contains a more complete understanding of what caused LaVoy Finicum’s untimely death. Please know that I am not an authority on the assassination of LaVoy Finicum, nor on the general rancher resistance to federal intrusion into the western States. I am just an observer on the sidelines. But I care enough to want to find the entire truth which led up to his murder, and so I often-times meditate on preceding conditions and circumstances. I do that because my instincts tell me that all things are inter-related, and are therefore singly important. Thank you for reading the following. May we all remain calm as we contemplate the ultimate meaning so meticulously presented in the above video. We at The Mental Militia recommend focusing our mental states on the joyful properties of Love’s Thought System. Love’s Thought System includes an understanding of the necessity of Forgiveness. The trigger-happy enforcement officers who did the deed had been trained psychologically to see Americans who would redress grievances to their government as “The Bad Guys”. It is now apparent that all officers involved, and their superior officers, were involved in an “operation”. We can know that because at least five patrol cars were waiting for LaVoy to drive up that highway. Further, a road block by Oregon State Police and the FBI’s dreaded HRT sniper team had already been in place well before LaVoy started his trip. The five patrol cars were in radio contact with the FBI/OSP roadblock officers. Two aerial camera were circling over the area, one higher than the other. This was no “traffic stop”. There also was no Fourth Amendment “Probable Cause”. No warrants had been issued for any of the people in the two vehicles enroute to meet the Sheriff of the next County up that road. No traffic laws were broken as justified cause to pull them over. We know that because no one was issued a traffic ticket at the first stop by the five or more squad cars. This tremendous police power was pre-ordained as an enforcement “operation”. Were “rules of engagement” given officers prior to the encounter with LaVoy? A mindset had been inserted into the officers’ heads by officials who set policy in government institutions. Those officials are political puppets of an ideology which I call “Statism”. Their training policy for modern-day police work (which includes input from the Southern Poverty Law Center and the Department of Homeland Security) is used to reinforce government’s claim to have a right to use force against dissenting U.S. citizens. The name for that phenomenon is “Tyranny”. It rode in on a centralized two-party system named Democrats and Republicans, and it has hypnotized our national perception with the use of televisions in our homes and mass-media in our public lives. The officers who murdered LaVoy will be protected by the Statist system, but will for the rest of their lives question why the government system deceived them into thinking LaVoy was some kind of criminal who deserved to be shot on sight. The officials who sent the officers to do the deed have a serious exposure to legal liability for their role. Who, for instance, authorized five patrol cars to await the approach of LaVoy, knowing he would be driving up that highway? Who ordered the FBI to be involved in a quote/unquote “traffic stop”? Who called LaVoy’s message of property rights and States’ rights “A Virus”? Which Governor insisted that the FBI not allow that “Virus” to spread? Who at DOJ in Wshington D.C. condoned the use of HRT snipers to subdue protestors who had no warrants, had threatened no one, were family men and conscientious Constitutional citizens, and had no criminal records? Who as head of the FBI agreed with the Governor’s request that the FBI put a stop to the Finicum/Bundy message and do so quickly? Who at Oregon State Police complied with the politicians and allowed OSP to participate in an unlawful assault on two vehicles traveling legally and lawfully up a public highway? Who decided to call the precursor to the ambush a “lawful traffic stop”? If it was a traffic stop, then why did no cops write any traffic tickets? The answer to that and many similar questions will come to the surface, just as Curt Kruse has analytically examined the fact that LaVoy had been shot at six times before the cop hit him with a non-lethal round and the OSP pumped three fatal bullets into LaVoy’s back as he reeled from being hit with that non-lethal round. Who authorized that one cop at the initial stop to shoot at LaVoy’s truck as it was stopped? Who authorized the FBI to shoot at LaVoy twice as he stepped out of his truck with his hands up in the air? I contemplate this undeniable fact — LaVoy was shot at at the stop, and he did not “reach for a gun”. He drove away, only to encounter a roadblock. Men at the roadblock shot three bullets into the front of his truck as he swerved into the snow to avoid hitting the road block vehicles. LaVoy did not reach for a gun at that time either. Then LaVoy was shot at twice as he stepped out of his truck with his empty hands raised high in the air. LaVoy did not “reach for a gun” even then, but continued to walk away from the truck without reaching for a gun. That is a total of six shots fired at LaVoy and not once during those six shots did LaVoy “reach for a gun”. The seventh time LaVoy was shot at was the first time a round hit him. That seventh shot was a non-lethal bullet which hit him while his hand were up in the air. That round caused him to reach for his side where the round struck him. Even though LaVoy reached for his side where he had been shot, he quickly brought his hands back up and there was no gun in either hand. The verosity of what I just noted is beyond debate. It is on the record for all to see, and it is now clarified very well by Curt Kruse’s video above. The above video tunes the viewer’s mind to the truth and away from the propaganda being belched forth from the fearful bellies of corrupted Statist conspirators — such as those who sent FBI and Oregon State Police to ambush good cowboys who were on their way to join the Sheriff of the next county up the road for a public meeting in which several hundred citizens were gathered to hear LaVoy. I am meditating here on Love’s Thought System and seeking spiritual empowerment that will help me remember the inherent purpose of Forgiveness. I am calm, but I also am aware and awake to realities which are not blocked by the presence of a television in my home. Let us be calm; but let us remain moral human beings. Let us also be aware of the significance of every detail surrounding the assassination of LaVoy Finicum. Love lives in the human conscience. Let’s use it for peace and for justice, for the good of mankind. Let us correct the errors of politically motivated law enforcement. Let us spread the truth to our neighbors, friends, and families. Let us do so in “Love’s Thought System”. Let us forgive as we also correct, and in so doing, let us seek justice demanding our wayward government to make whole the Finicum family which has been un-necessarily deprived of husband and father. Excellent post Elias. This should not be swept under the rug or forgotten what was done to prevent protesters reaching a ‘Constitutional Sheriff’ in the next county over. I’ve heard the land grabbing continues as nothing has been done to prosecute the Clinton Cabal, illustrating for the general population that our new President (TRUMP) does not as yet have a real Justice Department nor a functional FBI who ostensibly should have been capable of handling this level of national corruption resulting in the acquisition and sale of strategic materials (Uranium/Thorium) to foreign entities. Instead we have ignoramuses in DC pulling out all stops to get POTUS candidate for SCOTUS confirmation halted prior to an election…not that the whole circus is not without issues…is it true Kavannah was one of the architects of the Patriot Act? Is our President still ‘settling’ for whatever he can get out of the ‘vetting’ akin to McMaster formerly of the NSC & CFR? I’m still of mixed feelings about the changes and course in DC. The true legacy of rancher Lavoy Finicum is the Great Awakening which continues to freight-train its way through hearts and living rooms across America. We will continue to hold feet to the fire over all of it. Thanks for viewing and sharing your reflections. Am personally holding my breath regarding Trump. He gives a little and takes a little. I am beginning to pick up a bit of faith in the man, however. That is largely because I can truly appreciate the psychological victory we received when Trump pardoned the Hammonds in Oregon. That was actually huge. And BTW, congrats on the continuing growth at your radio station! Curt Kruse has again done a fantastic job in exposing for all to see the lies of the so called “law enforcement” officials surrounding their assassination of LaVoy Finicum. I hope that everyone who sees this video will also take the time to watch the 4 other Curt Kruse analysis videos of the assassination and see for themselves the truth of what our government did. The implications are dire but it is a truth we must all face, our government murdered LaVoy Finicum and they did it to stop his message of liberty from spreading. Let us all prove to them that they have failed to silence LaVoy and they have failed to contain his message of liberty. Thank you Curt Kruse for all that you have done and God’s speed to Jeanette Finicum. We love you and share in your sorrow for this terrible crime. We will bring these assassins to justice and expose them for what they are. I agree with all you are saying here except for being in a mindset of forgiveness with these murdering scumbags employed by the ABC agencies and other governmental services corporations like the STATE OF OREGON who are bound to serve us or DO NOTHING AT ALL. There is no gray area wiggle room here. They either serve American nationals or they are traitors, guilty of treason, for they serve a foreign-funded principal. No forgiveness. That’s what helps perpetuate the madness. And, as Judge Anna Von Reitz has made quite clear, as of October 8th of this year (2018), they have all defaulted on their delegated-services contracts, and We the People can now lawfully take over the operation of our government, as per the treaties and contracts that revert the operation of law and government back to the people due to massive fraud, murder, and general incompetence. We need no longer recognize any legitimacy or so-called authority of these bad actors in the disguise of those carrying out governmental services under color of law. You feeling me, you murderous goon squads??? Sui Juris Notices of Liability towards commercial liens for ALL of you are on their way. Look into it. Your false reign is done. I am not here to tell you or anyone what to think or how to think, so please do not be offended when I say that forgiveness is my escape from the past, and that I practice forgiveness quite often in my daily life. But also please know that I am keenly aware of the corruption which has existed since James Madison kidnapped the convention to upgrade the Articles of Confederation and thereby created a central government for the unwitting citizens of the thirteen sovereign nation-state republics and their heirs. I collect hidden history, but I do not let its poison taint my soul. I am free of much more than just “government” and its nefarious “contracts”. I wish for you peace and the freedom to achieve your highest good in this life.